Many great ideas come from combining two good things to produce one great thing; call it the peanut-butter-and-jelly effect. This truism holds as much for breeding as it does for anything else, with some of the most popular types of chickens, cows and other livestock resulting from the strategic combination of desirable traits. 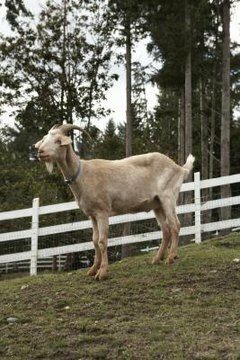 The nubian boer goat is an example of selective breeding between two popular breeds. The nubian goat is the superstar of dairy goats, a breed that delivers delicious, high butterfat milk in copious amounts -- up to a gallon a day. If you've ever enjoyed a schmear of chevre or crumbled feta on your salad, you've likely consumed the tasty product of a nubian goat. Boer goats, on the other hand, aren't noted milkers but are highly prized for their meat, which tastes somewhat like a cross between lamb and beef. Crossbreeding the two is usually a move to increase the quality of meat while retaining the nubian's milking ability. Goats pasture easily and require much less space than a cow or horse -- goats don't graze on grass, preferring a variety of plants that include berry bushes and even tree limbs. A nubian boer will also thrive on alfalfa or clover hay, though you should take care to eliminate, within a milk goat's enclosure, certain plants, such as chamomile and daisy, that make milk taste bad. Toxic weeds can also taint milk. Dairy goats benefit from supplemental goat feed and a mineral or salt mix, and all goats require constant access to fresh water. Goats are resilient animals able to survive in a variety of conditions, but they aren't invincible. Goats are particularly susceptible to catching chills that can lead to pneumonia. Goats require appropriate housing. For a nubian boer that can grow to at least 300 pounds, that means either an adequate-size shelter or a barn. A goat shelter should face away from the prevailing winds and should be clean, dry and well-ventilated. It should have enough bedding to keep the goats comfortable. Goats are notorious escape artists, breaking out of enclosures and turning feral in a moment's notice. Nubian boers aren't exempt from this inclination. A loose goat can cause untold damage to trees, shrubs and even cars, so you must take special care to keep a goat where he's intended to be. Fencing should be at least 4 feet tall and made of sturdy material. Woven-wire or chain-link fences work well and also protect these domesticated prey animals from predators like wild dogs.